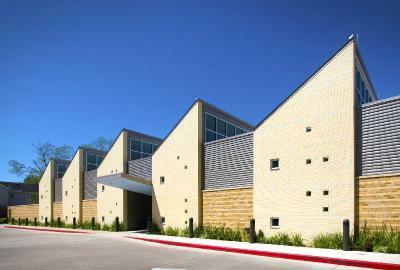 The 9,600 square foot child-care center for Rice University’s faculty and staff children, is located off-campus on three single-family house lots. The design resolves the undesirable major east and west orientation by introducing north facing clerestory windows for natural light. Flexible, loft-like space to accommodate changing age-group populations, service cores form an undulating rhythm of toy block-like multi-colored cubes, which also separate public from private areas. Designed to achieve LEED certification, materials are re-used from the demolished houses.